Dreaming of unicorns. I had a dream this morning that I was looking through a pile of my old sketchbooks, looking for stuff to scan for my new site feature (see below), when I came across a sketchbook from high school. In real life I always had a sketchbook with me at all times, but the one I opened in my dream existed only in my dreamworld. I opened it up to find page after page of unicorns. Brown, white, dappled, grey; they capered across the pages and out of the borders of the pictures. I had written an entire story to go with these pictures; some of them were two-page spreads with vivid green grass and scratchy black borders. I thumbed through them, fascinated that I could have done all this and forgotten all about it. But as I woke up, the pages faded from sight.... I tried, intensely, to get back into that dream and read more of my book. Later that morning, I remembered the Serendipity books.... did anyone else read these? I loved the illustrations. And that led me to find this book, which I think I need to get. 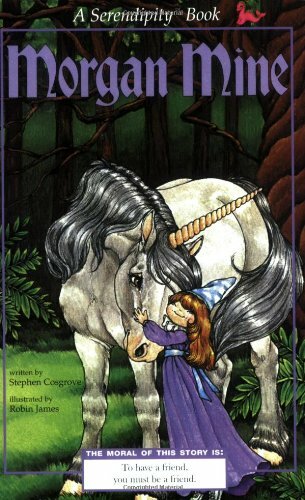 I think there's a unicorn book (or five) inside me just waiting to be written and illustrated and set free.